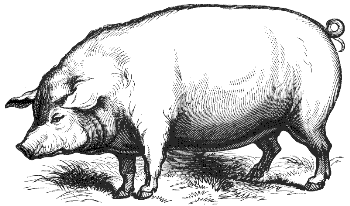 ... which began as a journal of one rescued pot-bellied pig's weight loss, and evolved into a compilation of all things porcine! In the meantime, if you're on FB, check out Habitats for Piggies - a page run by long-time pig advocate Ted Koran, with the mission to "provide resources and assistance for the sheltering and needs of piggies". There you will find ideas for building shelters for pigs of all sizes, ranging from simple, low-cost structures to much more elaborate abodes. 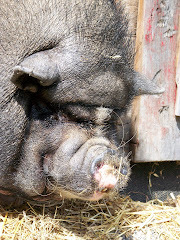 Plus a good dose of advocacy and news from pig sanctuaries. Definitely worth following! Posted by Allison at 12:53 p.m. Here are my two big pigs, Cee and Dee, enjoying the mild morning. This is their winter pen - small in size, but handier to their winter pen - which has easiera ccess for me feeding, plus more level footing for them. Cee has had a sore R carpal joint this winter - 4 cycles of Bute seems to have cleared it up, but frolicks like these sometimes make a her a bit tender. Can`t begrudge her the pkay time, tho! Posted by Allison at 12:03 p.m.
Beginning this academic year, recruiters with the University of Arkansas’s Office of Admissions will travel the state in style and “Call the Hogs” along the way, thanks to a gift from Jim Jard Volkswagen in Rogers. During the past six months, that gift, a 2002 Volkswagen Beetle valued at $15,500, has been transformed into a rolling Arkansas Razorback, the first of its kind. Posted by Allison at 8:43 p.m. The farmer in Axedale, a town in Victoria in the south-east of the country, called the emergency services after believing he had smelled gas. But when the fire crews arrived, they found the real culprit – a 260lb sow the family's children kept as a pet. However, despite the false alarm, Mr Harkins said the farmer had done the right thing by calling 000 (the Australian equivalent of 999). He told The Melbourne Herald Sun: "It's all bottled gas up here and a leaking cylinder could pose a major fire risk. "It was because we took it so seriously that 15 volunteers still managed to attend the call out at 10.30 on Tuesday night." 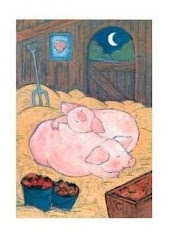 Posted by Allison at 10:29 p.m.
Posted by Allison at 10:26 p.m.
A cute article about a friendhip among pigs. Posted by Allison at 10:25 p.m.
Posted by Allison at 9:43 p.m.
Daisy was the inspiration for this blog, which was started to document her progress after arriving at our farm in May 2007. 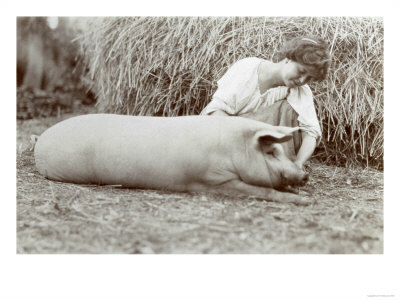 At the time, she weighed 275 lbs, had badly overgrown feet, and was not able to walk without difficulty. In her seven months with us, Daisy lost 75 lbs, and was enjoying new-found mobility. Following a sudden, severe illness, Daisy was euthanized Sunday, December 23, 2007. Post-mortem revealed septicaemia of unknown origin. fellow prisoners of the splendor and travail of the earth." 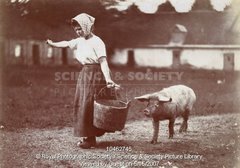 Wondering whether to spay your female pig? Read This! The Truth About "Teacup Pigs"
Great video on restraint and hoof & tusk trimming! Pig Placement Network - SVP Consider Adopting! Pig Preserve Video Clips - Great! Mourning a lost animal companion? Had a Crazy Day? Click here! Need a ramp to get your pig into your car or van?